Popcorn cart provides easier access, better merchandising and great mobility. This popcorn cart serves both home popcorn popper equipment and commercial popcorn machine for the business oriented user. The sturdy all steel construction also has a chip resistant coating. Also features convenient built-in storage space and breaks down easily for storage and transportation. 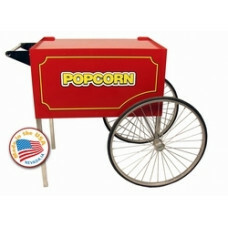 Our large popcorn cart fits the 14 oz classic popcorn machine, ready for fast delivery. Thanks to above combination you can get a delicious popcorn in 3-5 minutes. Please note, our affordable 14 oz classic commercial popcorn machine is for every entrepreneur due to its reliability, ease of use and on top of that, it is lightning quick, when it comes down to cleaning it. Our company also continually offers quality popcorn supplies, such as: 4 oz Authentic Theater Popcorn Portion Packs Bulk Paper Popcorn Bags - Large Superior Grade Bulk Popcorn Kernels Popcorn Buckets 32 oz Popcorn Butter Proof Bags - Medium Popcorn Closed Top Boxes Popcorn Seasoning Please go to our popcorn supply and popcorn accessories section for more affordably priced items. And as always, do not forget about our gift certificates.